ROME, May 2, 2010 (AFP) - Roma were left fuming on Sunday after Inter Milan's 2-0 victory over bitter city rivals Lazio allowed Jose Mourinho's side to edge closer to a fifth successive Serie A title. Inter's win was even cheered by Lazio fans, desperate to see second-placed Roma fail in their title bid, inside the Olympic Stadium. "I never thought I would see with my own eyes what I saw tonight," said Roma director Gian Paolo Montali, who criticised both the Lazio players and fans for their behaviour. "I believe even Inter and their coach are embarrassed. I believe that today it wasn't only Lazio who lost but also sport and, in particular, our football." Inter followed up their passage into the Champions League final with the victory and with just two games left, they restored their two-point lead over Roma, who won 2-1 at Parma on Saturday, and also stayed on course for a treble. They face Roma in the Italian Cup final on Wednesday and Bayern Munich in Madrid on May 22 in the Champions League final. Inter face lowly opposition in their last two league games - Chievo (12th place) at home next weekend before a trip to relegated Siena (19th). Roma also face Chievo a week after welcoming 14th-placed Cagliari. But Roma could have a 'joker' to play because if the two sides are level on points at the end of the season, the capital city side would be champions thanks to their better head-to-head record against Inter. A 1-1 draw in Milan was followed by a 2-1 home win at the Olympic Stadium. On Sunday, Lazio fans, with their team languishing two places off the relegation zone, cheered when Argentine defender Walter Samuel headed in the first goal on the stroke of half-time from a Wesley Sneijder cross. Inter, fresh from knocking defending champions Barcelona out of the Champions League in midweek, piled on the pressure, but found Lazio goalkeeper Fernando Muslera in inspired form. Muslera saved well from Maicon, Thiago Motta, Sneijder and Samuel Eto'o in the first half. But the home side's resistance crumbled in the 70th minute when Motta scored from a Maicon corner. At the final whistle, even Lazio fans, who had also unfurled a banner in praise of Mourinho, celebrated Inter's win. "We were motivated," said Lazio's assistant coach Giovanni Lopez. "But the atmosphere was surreal in the stadium. It was against us and didn't help. "After their first goal went in, there was nothing more we could do." 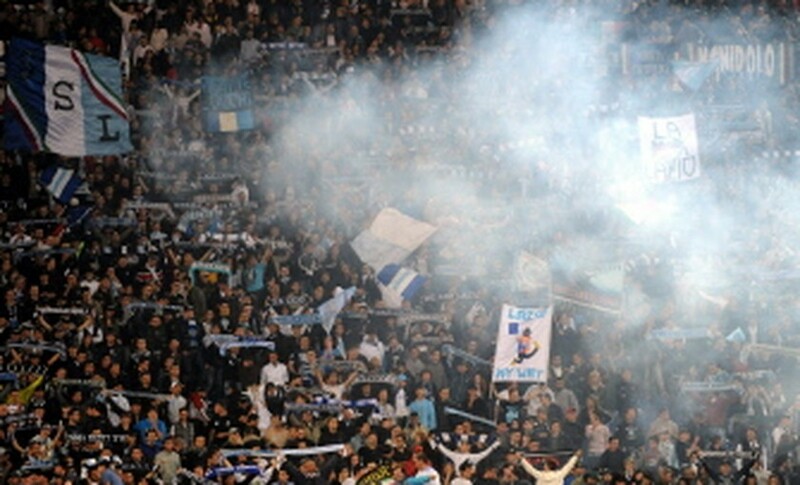 Inter's sporting director Marco Branca said: "There's been a bond between the Inter and Lazio supporters for many years. "But I stress that at the end of the match, our players were very tired because they fought for the win." Earlier, Sampdoria and Palermo remained locked in battle for fourth place and the final Champions League qualifying spot after both recorded wins. Sampdoria, who lead Palermo by two points, at times laboured to a 2-0 success at home to rock-bottom and already relegated Livorno while the Sicilians held on to a 2-1 victory at Siena. Cassano should have given Sampdoria breathing space six minutes before the break but somehow contrived to fire wide from a great position. Cassano was having one of his champagne days on the pitch and twice set up Giampaolo Pazzini but he couldn't finish. However, six minutes from time Swiss full-back Reto Ziegler crashed home a free-kick to calm Sampdoria nerves. They stay fourth, four points behind AC Milan.